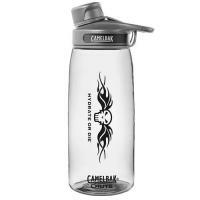 The custom-print 1-Liter Chute HOD Bottle from CamelBak® bottle gets to the point: Hydrate or Die! The angled spout delivers a steady flow of water without mess or spill, while its spout snaps into the handle for convenient drinking without interference. A tether keeps the cap close at hand during refilling, preventing loss. Internal threads located on the half-turn cap allow for smooth drinking directly from the bottle. CamelBak's® gear is made entirely of BPA/BPS-free materials, including the BPA-free Eastman Tritan™ copolyster bottle and a cap constructed from BPA-free polypropylene.